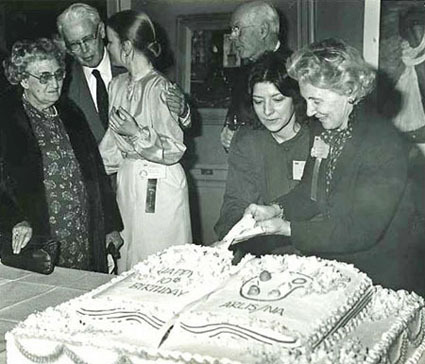 Caroline Backlund, president of ARLIS/NA in 1982, cuts a cake celebrating the society's 10th anniversary at its annual conference in Boston. "ARLIS/NA is a growing, dynamic organization promoting the interests of nearly 1,000 members. The membership includes architecture and art librarians, visual resources professionals, artists, curators, educators, publishers, students, and others interested in visual arts information. To serve this diverse constituency, the Society provides a wide range of programs and services within an organizational structure that encourages participation at all levels."